Coconut Oil MCT Capsules, 180 capsules (Health From The Sun) - Penn Herb Co. Ltd.
Coconut Oil is one of nature's best sources of medium-chain triglycerides (MCT'S) which play a key role in the body's metabolism of fats and energy production. MCT's are more rapidly absorbed by the body and therefore more quickly metabolized as fuel. 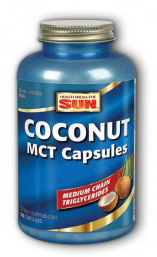 Health From The Sun Coconut Oil MCT capsules offer the benefits of MCT oil in the convenience of a capsule. Each 3 capsule serving provides 800 mg of MCT. Source of medium-chain triglycerides (MCT), which supports fat metabolism & energy production. Use only as directed. Take 3 capsules daily with food or as directed by your health care practitioner. Store in a cool, dry place.